I’m basically just like Oprah, in many ways I’d like to think, but we’ll start first with the fact that I (also) LOVE BREAD. I just do. And I’m really not picky either. I’ll take it in all forms: seeded, crusted, whole grain, wheat or even Wonder. Lather it up with some salted butter or a little EVOO and you’ve got me right in my happy place. But, sadly, instead of “breaking bread” with Queen O on this one, I feel it’s time to take the opposite approach and break UP with my favorite carb pastime. And, just like any other kind of split, I’ll be the one to say, it’s not YOU bread, it’s ME. We have such a love/hate relationship at this point that it’s truly not healthy. And since I’m coming up on six months to being aisle and ring-a-ding ready, I think I need to be the stronger one here and bid thee bread adieu. I may or may not have a tear in my eye as I’m typing this, or a little belly grumble-rumble, thinking of all my newfound meal and snack restrictions. Really though, I can live without bagels, baguettes, pita and panini until November. There are SO many other options out there! It may not be easy (or fun) and I’m guessing temptation for a little “make-up quickie” will be beyond difficult to resist but that’s why I have YOU and my mantra of “I Can, I Will, I DO!”. I CAN and WILL do it. That’s just that. 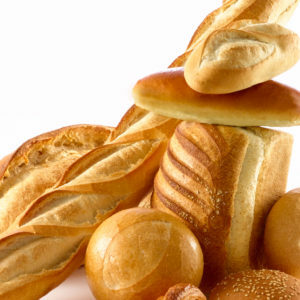 I’m not saying at all that bread is horrible, or even bad for you – if you ARE a bread lover like me, do be careful though because lots of loaves are packed with add-in SUGARS. I’ve learned that farmer’s market, homemade or Whole Foods bread is the best for you. I just know that for ME, bread’s my total weak spot (everyone’s got one!) and in crunch time, literally, it will be easier to live without it. So let’s make a “toast” (get it?!) to getting healthy, knowing our bodies, and making it down the aisle not looking like the Pillsbury Dough Girl. Please! Have you tried flax bread? 50 calories and good for you!